A mysterious distress signal is detected from the Boötes constellation near the star Arcturus, prompting an emergency rescue mission where an old friend, in the company of a giant, flying alien jellyfish, go in search of a mysterious–and missing–man called McNONYMOUS. 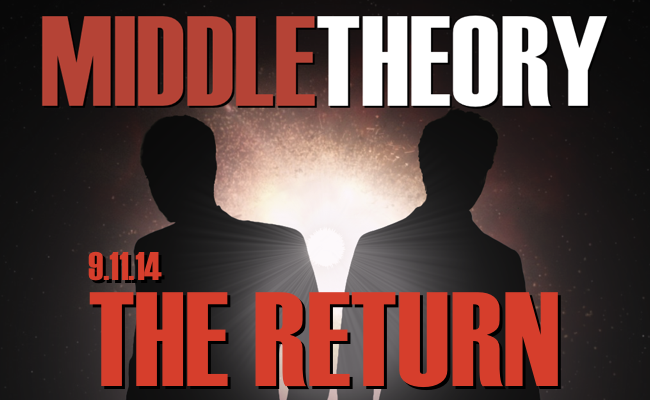 The long awaited return of Middle Theory launches into the midst of a media fray on the thirteenth anniversary of the greatest terrorist attack on American Soil. In the news, along with remembrance of the 9-11-01 attacks, is discussion of a new video that offers damning evidence in the shooting of Michael Brown, as well as a shocking verdict now expected in the Oscar Pistorius case. We then turn our attention to the Ray Rice scandal, and not only the fact that Congress is discussing intervention, but also that former FBI Director Robert Mueller III will be investigating allegations that the NFL has known all along what really happened on the elevator that night. The big story involves President Barack Obama’s recent speech on the eve of 9-11-13, and discussion of the strategy his administration is planning to employ against the growing threat of ISIS (ISIL) in the Middle East, and the strange bedfellows that emerge especially with regard to Syria, and existent problems with assisting rebels who, as has been widely discussed previously, could include radicalized Muslim individuals and groups. America is looking at a very shaky situation in the Middle East… brave new world, indeed. Finally wrapping things up, has the mystery of Jack the Ripper finally been solved? This is what one British author thinks… but here in the Middle, we’re still skeptical. Lastly, did you like this episode? We’re very glad to have rescued McNonymous, and to be here providing you views from the radical center. Please consider sharing a link to this show page using the social media buttons below, and comment (or email us) and let us know what you thought of it, and the fine auditory condiments we’re able to offer you from the Middle of the known Universe. You’re all such Princes… and with Der Gople as our witness, we’re back, and we’re here to stay. This entry was posted in Uncategorized by Micah Hanks. Bookmark the permalink.